Want to turn your community college into an effective recruitment platform? If you’re working in IT or marketing within a community college you will probably be very familiar with the increasingly heavy demands that are being expected of the college website to perform. These expectations are sought by both users and proprietors of the website. Users want to be able to readily find the information they’re looking for and the college powers that be want to ensure that the website is driving recruitment. The community college should no longer serve as a static information tool and instead should serve as a recruitment platform; one that sells your institution to its target audience. Student recruitment has always been an integral part of higher education. Sure, the means by which students are recruited may change but the goals will always remain the same: Meet (and exceed) the student recruitment goals of the college and improve the overall quality of the student population. If your college is struggling to meet KPI goals and transform website visits into real life students then you need to sign up for our next webinar. TERMINALFOUR and full-service creative communications agency iFactory have joined forces to help you transform your community college website from an information tool to a knock out recruitment platform! 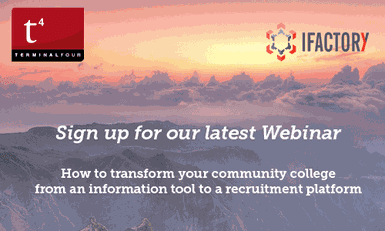 Full details and registration for the webinar can be found here. Don’t worry if you can’t make it on the day, sign up and we will send you a link to a live recording.